"Mexico Oil Privatization Pays Off With Billion-Barrel Find" | Watts Up With That? "Mexico Oil Privatization Pays Off With Billion-Barrel Find"
Mexico’s decision to allow private companies to explore for oil and gas started to pay off after the discovery of at least a billion barrels in a new offshore field. A consortium of Premier Oil Plc, Sierra Oil & Gas S de RL de CVand Talos Energy LLC made the discovery in the shallow waters of the southern Gulf of Mexico just two years after winning the exploration license. It’s the first new find by a private company in the country in almost 80 years, according to consultant Wood Mackenzie Ltd., possible only after the government ended the monopoly of state-run Petroleos Mexicanos. The stability of the Mexican government is the only problem I see in all this. Finding oil/gas is all well and good, getting it out of the ground, transported and sold all while dealing with officials who can change in the blink of an eye makes it all rather uncertain. Historically, the Mexican government these days is pretty stable. All bets are off if Andrés Manuel López Obrador get elected president next year. He is a socialist. He’s more or less said that Mexico would generally honor existing contracts if he wins. Of course, dealing with Nieto is infinitely preferable than Obrador. Should Lopez Obrador win the presidency, he would leave in place energy contracts already signed with private producers so long as they were “good for the nation,” but might not allow new ones, his adviser Alfonso Romo told Reuters. On the whole, it would be better if he loses. His preference is to go back to propping up Pemex. Money from oil is minuscule compared to Mexican government’s vig from meth, heroin, cocaine and remitted monies from their nationals illegally in America. I worked with PEMEX, living in Tampico Mexico in the late 60’s on a major project, and was told by friends there a little bit of oil history in Mexico. Mexico nationalized all oil assets in 1929 and threw out the foreigners who were involved in developing the oil fields. .
Those who I knew told me that new discoveries were essentially stopped without foreign expertise. Development in Mexico started again only after they let foreign investors back in and apparently they recently have allowed further foreign investment again. In the mid 70’s Venezuela nationalized the oil fields. They too allowed foreign investments back in after little new development only to throw the investors out again under Chavez. Their industry including oil, and people have been crippled by the latest socialistic regime. Saudi Arabia gradually took control of it’s oil fields starting in the mid 70’s and ultimately took full control by 1980; however, this was not by Nationalization but by deals with the previous owners and they were wise enough to retain foreign expertise.. Anyone who is in the oil business today knows that if they invest in certain countries there is always a risk of Nationalization or unfriendly government takeover; and that includes Mexico today in my mind. It also includes the US. Did you work with any men named Dedeaux, Redmon, Bassett or Debraux hailing from southern Mississippi or southern Louisiana? I had several uncles and cousins who worked in Mexico in ’60s and ’70s, some directly for PeMex and others for Brown&Root, Hali, etc etc. They loved the country and people, hated dealing with their government at all levels. Mods, Sorry for a repost, this comment dumped to bottom of thread for some reason. David, you are right, The Democrats are still complaining about the reduced royalty incentives President Clinton offered to get oil production moving when the crude price was low and the incentives were small for deep water drilling. Somehow it appears that Democrats like other countries having control over our energy supply, raising prices and undermining national security. No I never ran into any of the names you mention. There were very few gringos on the project I worked on. This was the first project, at least in refining, that PEMEX did all the field construction work themselves with only one McKee contractor on site to coordinate questions between McKee, the design contractor, and the local PEMEX construction group. I was part of a team to check out the plant and assist in the startup of a licence technology that process heavy bottoms to make lighter products. For me a a young engineer it was a great experience, since there were numerous construction errors to find and get corrected to make the plant operable and safe. I did not speak fluent Spanish, but had great relationship with the Mexican Engineers at the working level and we could communicate on the engineering level with sketches, etc. The Mexican workers and lower level engineers were all conscientious and pleasant to work with. The PEMEX management lessor so. There was also that totally unlawful offshore drilling moratorium and then “permit-orium” and the regulatory malfeasance in the Chukchi & Beaufort seas in the aftermath of Macondo (Deepwater Horizon). It is always worth asking. Many of them worked as construction pipe fitters and welders/fabricators, most were rig men, toolpushers and deckhands and such. A few geologists and electrical engineers, some crane operators and three chopper pilots. Lots of them spent years, on and off, working at Amerada Hess refinery complex in Purvis, MS and other plants in LA and around Huston. You know the deal, Oil Gypsies. Off topic is an understatement. Off topic and totally irrelevant. Ice bergs are breaking off all the time, and considering how much the ice shelf has grown in recent years, it’s hardly surprising that big chunks of ice break off. It is of topic. If you think this is irrelevant think again. See CNN, ABC, etc. etc. Watch the newspaper coming. This will bring back CLIMATE CHANGE is REAL in a HURRY. “This will bring back CLIMATE CHANGE is REAL in a HURRY.”…..more like a whimper. Maybe the Russians are hiding the evidence? Which FNN has merrily proceeded to drown in the toilet bowl of Man Caused Globall Warmining, as of 20:30 EST. Only thing I saw on FNN webpage at 8:30 PM was TRUMP COLLUDES WITH RUSSIA!!!!!!!!!!!!! Oh, and CALIFORNIA BURNING BECAUSE OF MAN CAUSED GLOBALL WARMINING BECAUSE TRUMP COLLUDED WITH RUSSIA!!!!!! And something about children starving without school lunches because TRUMP COLLUDED WITH RUSSIA!!!!!! Shortly to be released is the 10 hour miniseries about the canonization of Saint Hillary because TRUMP COLLUDED WITH RUSSIA!!!!!!!!! And I think there were some pictures of puppies starving because TRUMP COLLUDED WITH RUSSIA!!!!!!!!!! Curiously, not a word about the 1.9 million dollar profit Saint Hillary pocketed from the Uranium1 deal she personally brokered with RUSSIA as SecState. Guess they will get to that tomorrow. The crack that led to this iceberg started over 100 years ago. There is a subsurface ridge under the ice-shelf which continually makes new cracks in the same location as the ice-shelf slowly moves out to sea. There are about 7 other cracks coming in behind and over the next 100 years, there will be 7 more ice-bergs coming out from the same location. This is what Antarctic ice-shelves do and have done so for 34 million years. One of the local radio stations in Ontario, Canada plays the BBC news. There was an ice expert who explained that this was how things worked. She described it as ‘business as usual’. A bit after the BBC news the local announcer did a piece on the calving ice sheet. Holy Hyperbole Batman! The stark contrast between the two versions of the same story on the same radio station was perhaps the funniest thing I’ve heard all day. r2d250, natural, cyclical occurrences of ice breaking off is of little interest, unless it’s for use by the usual scare-mongers (MSM & like-minded scum). 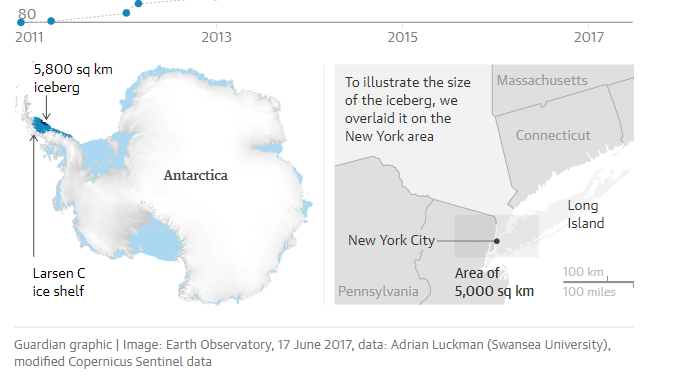 The 5,800 sq km calved iceberg is about 12% of the Larsen C ice shelf (50,000 sq km). The map of Antarctica clearly demonstrates the size of the iceberg. David, you have an uncanny ability to produce germane graphic information. Do you know how many shipping lanes supply Antarctica? And perhaps more specifically, how many ice breakers these shipping lanes require to remain open? I don’t know… But I can probably find out. I had to add the -arctic because the search returned mostly tales of expanding Arctic shipping lanes. It mostly returns decades of Delaware, 2x Rhode Island and other small-State-sized icebergs drifting into the Drake Passage and potentially disrupting shipping. Well then .. send the Titanic and sink the iceberg! Wait and see. Speculations will be coming. “In 1893 (after arriving in Nelson in September 92), the iron sailing ship “Margaret Galbraith” was homeward bound around Cape Horn. Mr. N.H. Burgess the 2nd Officer reported that from three days north of the Falklands to about one weeks sailing north of the Falklands they were “among the ice,” which culminated with a days sailing past a single giant berg “40 to 50 miles long,” The account suggest the ship may have been only making 3 to 5 knots around this time, certainly at night one would expect them to throttle back. They had a close call on first encountering the ice north of the Falklands. The distance from Faklands to Antarctic is 4,123 kilometers. How long was the iceberg at sea and what size was it when it broke off? David, you might know this…..How much of this country is off limits for oil and gas? I would bet if we bring those areas back online…there would be no more talk about peak oil. Peak oil is a real thing. It’s out there somewhere. Most of the Federal Outer Continental Shelf (OCS) is off-limits, as is ANWR Area 1002. Last time I checked, something like 85% of the OCS was off limits and a recent BLM report said that about 50% of onshore Federal lands were off limits. If everything was opened up and someone figured out how to economically develop the Green River oil shale, the US would have a total recoverable resource of about 1.4 trillion barrels. This would put Peak Oil off to the 23rd century. Green River shale is misnamed. Its kerogen shale that never entered the catagenesis window. The physical constraint limit on development (either mine/retort or in situ retort) is water. That’s what “oil shale” is… A kerogen-bearing fine-grained rock. As opposed to “shale oil”… Oil produced from shale. I think that a way that the “out there somewhere” issue could be framed is in the context of a particular price for crude, in constant dollars. That is, one could construct a family of curves showing how the peak moves out in time with increasing price, as resources are redefined as reserves. With a high enough price, even Ohio limestones might become a source for oil. If one hits a boulder with a hammer, the smell of hydrocarbons is often nearly sickening. But, if it takes more than a barrel of oil to blast, crush, transport, and heat the limestone to get a barrel of oil, it isn’t going to support our energy needs. There are a lot more moving parts besides price in figuring out what the total recoverable resource is. Over the past few years, oil companies have managed to nearly halve the break-even price for most shale oil plays. The break-even price for deepwater development has also been declining and is expected to continue to decline. 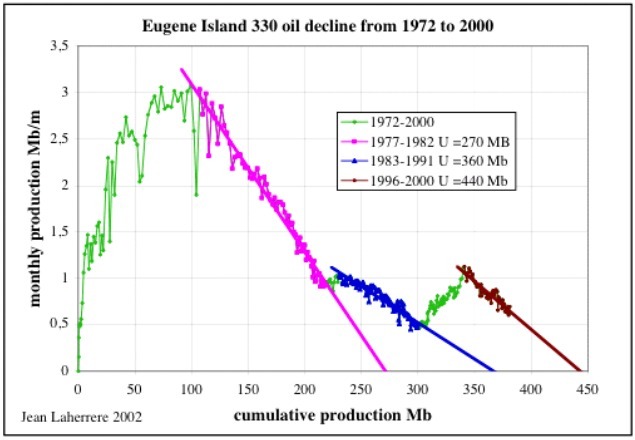 Every improvement in geophysical imaging and drilling/production technology drives Peak Oil further into the future. Hubbert kind of went through a similar exercise. He calculated US Peak Oil with two different total recoverable resource estimates, both of which were way too low. You said, “There are a lot more moving parts besides price in figuring out what the total recoverable resource is.” OK, fair enough. Technology that reduces the cost of production can also result in resources being moved into the category of reserves. So, let me re-state my point: If ever lower ‘grades’ can become profitable, either by increasing sale prices, decreasing production costs, or both, then the reserves increase, moving the peak out into the future. However, there is a lower bound on production costs. On the other hand, the upper bound on the selling price is a lot more flexible, being determined by whether or not people are willing to pay the asking price, or decide to look for substitutes. An increasing profit margin will attract capital, but an increasing price may reduce demand, also moving the peak out into the future. It is a complex issue with many variables, but I think that Hubbert did the world a favor trying to quantify the problem, even if he did underestimate ultimate reserves. At some point all of these factors will determine what the total recoverable volume is and when Peak Oil will have occurred. Considering what Hubbert had to work with, he did a great job. I’d be more excited if they found a place to put a solar panel farm that generated electricity 24 hours a day. You know, like Spain had. How about airplanes that follow the Sun? Don’t laugh, remember that people are trying to extract CO2 and stuff it into the ground. There is a solar powered aircraft that follows the sun. It barely produces enough energy to keep itself aloft and it needs to steer well clear of any weather. And, long extension cords would not be helpful. How is this useful for energy production on the ground? Just like satellite power generation for terrestrial use, a bad idea. Let the space based power stations power the space based factories (when we get around to building them). Obama funded those kind of ideas without proper vetting with zero results for probably a trillion dollars. Leave it to the private investors. To Obama’s credit, he didn’t block LNG exports and he signed off on ending the ban on crude oil exports (in exchange for an extension of wind & solar tax credits). I suppose it’s relevent to talk about oil discovery on a website that purports to be about global warming and climate change. Yes, yes it is. It is also relevant to discuss government corruption and the corruption of the sciences on a blog that is supposed to be about climate change and the lie of globall warmining. The longevity of fossil fuels is relevant to the climate change debate. Why am I not seeing info in the comments regarding the replacement of the term ‘fossil fuels’, with the term “abiotic”? Because that is irrelevant. 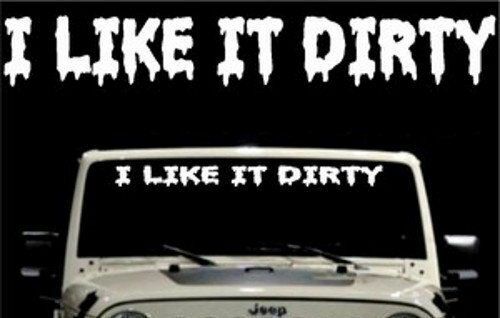 People want electricity, natural gas and fuel for internal combustion engines of every type, we really don’t give a f**k what particular nomenclature is applied to it while it is in the ground. Call it Faerie Farts! No body cares. Besides, the comments have been pretty well taken over by the second largest iceberg seen in the last couple of decades… Which is also not related to climate change. Dumping 30Gt of CO2 into the atmosphere in a geological heartbeat…what effect could that possibly have? Shouldn’t you be screeching about TRUMP COLLUDES WITH RUSSIA!?!?!?!? Come on, get with the program, you were sent the email now start screeching!!!!! Tony, seriously …. what a silly comment without some context. CO2 is still a trace gas and you seem to be ignoring CO2 sinks or perhaps u conveniently ignore them. Not to mention the total mass of the atmosphere … millions of tons of anything might not matter in something that is measured in the trillions. Indeed Tony, please move along! 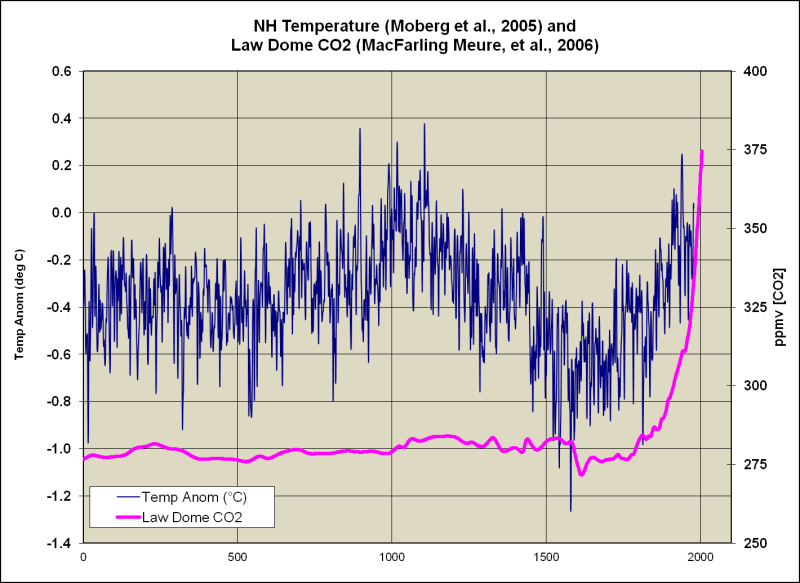 McClod, since CO2 has very little impact on climate, it doesn’t matter how much is dumped into the atmosphere. PS: Plants are very happy with all that new CO2. Some folks here don’t have their stories agreeing as to why increasing CO2 won’t have a significant effect. Some say it’s a trace gas, others say its effect is already saturated. It can actually be both a trace gas and saturate its bandwidth. Let’s see if I can get this right: The oceans dump about 90 gigatons of CO2 into the air each year. And we should look for ‘the effect’ of another 3? Is that the worry? Looking at the temperature plot of the globe over the past couple of million years, it seems that inter-glacials are heartbeats, on a geological time scale. Are mankind’s contributions enough to prevent the next Ice Age? Not by a long shot. Long before we reach Peak Oil in 3 or 4 centuries, we will have invented far better means of generating energy for terrestrial and space transport. The only real ‘value’ of the current nuttiness about CO2 is the waking realisation that we all share this planet and its resources, and that our portions are shared in a manifestly iniquitous manner. Global resources should develop the globe. We are still far from “peak civilisation”. 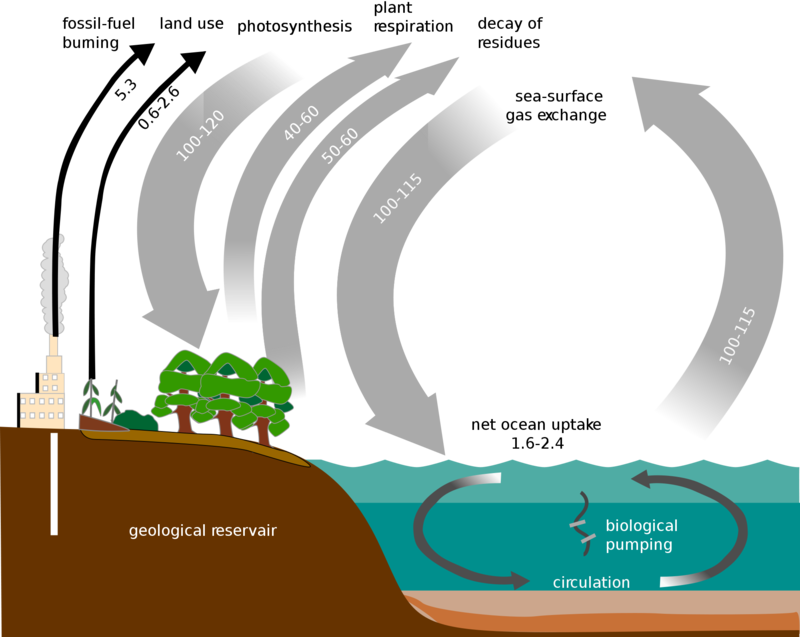 The difference between the ocean’s contribution and ours, is that our contribution is a net addition to the active carbon cycle. Crispin: That 90 Gt per year is not an ongoing net source, but seasonally emitted and reabsorbed. Tony, 30 GT of carbon is but a drop in a bucket. The supposition of catastrophic anthropogenic climate change is earth will convert to a Venus system rather than revert to a Carboniferous system is patently absurd. Life finds a way. The stromatalites which caused the oxygen catastrophe are still living. Considering the total mass of the atmosphere is about 5×10^15 tons, adding 3×10^9 tons of plant food isn’t a big deal, except for the plants which love it. It probably also slows down nighttime cooling, resulting is slightly higher minimum temperatures around the world, especially in higher latitudes. This is also a good thing. So crisis averted; sorry, but you’ll have to find another excuse to tell other people what to do and how to live. Donald, if you were half as smart as you mother says you are, you would know that both statements are true. It is a trace gas and it’s almost saturated. Please try to learn something about science. This “silly” trace gas zombie meme shows a lack of thought. Ozone is even more of a “trace gas” but we’d be dead without it. Trace gasses can make a significant difference. Sure Paul, whatever you say. CO2 has no effect; that thoughtless twaddle gets wheeled out here every second post, regularly by numbskulls like andy and mark. At the same time it’s essential plant food, it’s greening the deserts and anyway what’s wrong with a couple of degrees warmer? It must get tiring holding these two opposing facts in the air all the time. What’s so difficult in comprehending the fact that life on Earth depends on several trace gases. As a trace gas, CO2 is essential for life on Earth. At a concentration of 8-15%, it can be lethal. Yes, silly pretty much describes you. Tell us again how the world is ending and we are all coing to die in a fiery flood. We love that fantasy tale. Don’t forget that at 97%, nitrogen can be fatal. 97% O2 can kill you too. Of course. But then to say it’s effect (because it is a trace gas) is: “very little” or “none” is some kind of delusion. But you can read that delusion on just about every page here and in an echo-chamber like this it becomes self-reinforcing. As do a whole wagon-load of other delusions like: it’s a “socialist plot” or the “scientists are lying for the money”. Its effect isn’t minimal because it’s a trace gas. It’s minimal because the climate sensitivity is low… TCR ~1.35 C, ECS ~1.75 C.
“scientists are lying for the money”. So, why all the lying? Enlighten us, oh deceptive one! Oxygen is delivered at a concentration of 100% to high altitude pilots via their masks/oxygen systems. 2) at increased partial pressures. It is also known as oxygen toxicity syndrome, oxygen intoxication, and oxygen poisoning. Historically, the central nervous system condition was called the Paul Bert effect, and the pulmonary condition the Lorrain Smith effect, after the researchers who pioneered its discovery and description in the late 19th century. Severe cases can result in cell damage and death, with effects most often seen in the central nervous system, lungs and eyes. Also, the high O2 concentration in the Apollo 1 (AS 207) capsule wouldn’t have been as dangerous at a low atmospheric pressure as it was at ~1 atmosphere. The plants should like it. Might raise the ppm count a point or two. Yawn. 36 Gt CO2 is about what we are adding annually from burning fossil fuels, enough to raise CO2 by 4.6 PPMV per year, plus a little more from land use change. Nature has been removing about half of this on average over the years. The only thing different about our contribution is that we are removing carbon from geologic sequestration and adding it into the active carbon cycle. That 5.3 for fossil fuel burning in the graphic looks low to me. The past several years have averaged above 9, and that’s gigatonnes of carbon. It is low. It was 9.1 GtC in 2016. “Reservoir” is also spelled wrong. The point is that our contribution is very small compared to “natural” sources. The only thing special about our contribution is that we are moving carbon from geologic sequestration into the active carbon cycle. Every year, we increase the total pool of carbon in the cycle. The carbon cycle is generally denominated in Gt C, not Gt CO2. You said, “The only thing different about our contribution is that we are removing carbon from geologic sequestration and adding it into the active carbon cycle.” I think that it would be more accurate to say that humans are accelerating the rate at which the geologically sequestered carbon is being released into the atmosphere. There are many underground coal fires that were started by lightening and have been burning for centuries. There are many oil seeps both on land and in the ocean, which are being oxidized by bacteria. I’m not sure that we have a good handle on the magnitude of the natural hydrocarbon releases. The coal and petroleum that are currently buried may eventually be exposed at the surface by erosion, and it will then either burn or oxidize slowly, releasing CO2. Alternatively, it may get subducted and be released through volcanos. And we don’t really have a good handle on the natural components of the carbon cycle. David you must remember to include sinks with your “natural”. When you do the cancel out the natural sources. It means the delta due humans far out ways the natural delta. 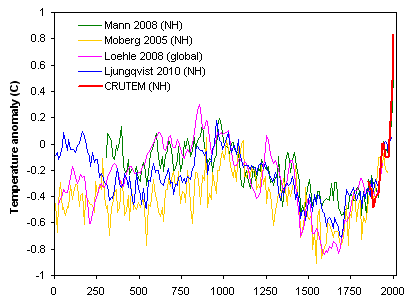 Our “handle” is more than adequate to show the rising CO2 concentration is anthropogenic. If raising the concentration from 280 to 410ppm didn’t have an effect – that would be weird and take some major rethinking of the theory. The sinks can’t tell the difference between natural and anthropogenic CO2. We add about 4 ppm to the carbon cycle each year. Half is quickly taken up by sinks and about half hangs around in the atmosphere for at least a year. David, lets overlay the graphs, add a couple of others and get it up to date a bit more. There, thats a more realistic picture. 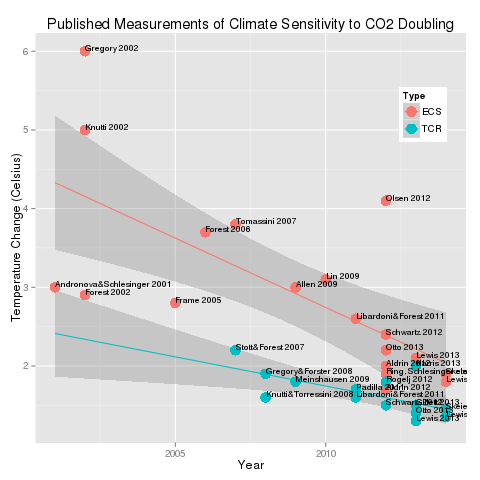 As far as sensitivity goes to doubling CO2, do you think it is wise to ignore all the feedbacks? Albedo for example. When they are included this distribution is a probable total effect. Quite a discernible effect I’d say. So, throw in some faked data and it has an effect? Okey dokey, then. You just posted the SkepSci version of Mike’s Nature Trick (splicing high resolution instrumental data onto low resolution proxy data) and the thoroughly debunked model-derived sensitivity… which even the IPCC has backed away from. How are simulation and masturbation alike? Do them both often enough and you start to think they’re real. 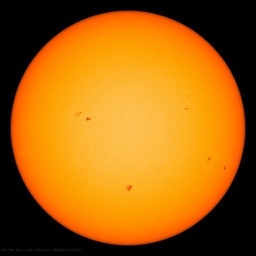 Please refrain from plotting low resolution proxy data alongside high resolution modern temperature data. How do those plots look if you ONLY use proxy data? Actually forget what I said. Its better if you display your bias for all to see. Especially new people who want to understand why sceptics believe what they do. These models have excessively positive feedbacks, such as significantly positive cloud albedo feedback combined with water vapor feedback being at least that of constant relative humidity. I believe the cloud albedo feedback is slightly positive (clouds getting more efficient at moving heat due to more water vapor make them cover less area), but this requires decreasing overall atmospheric relative humidity as the world warms. It’s not spliced on. It’s just displayed on the same graph. I smoothed both with 30-yr averages to better reflect climatology and to make them more “apples to apples.” Although, the resolution difference still makes a direct comparison problematic. 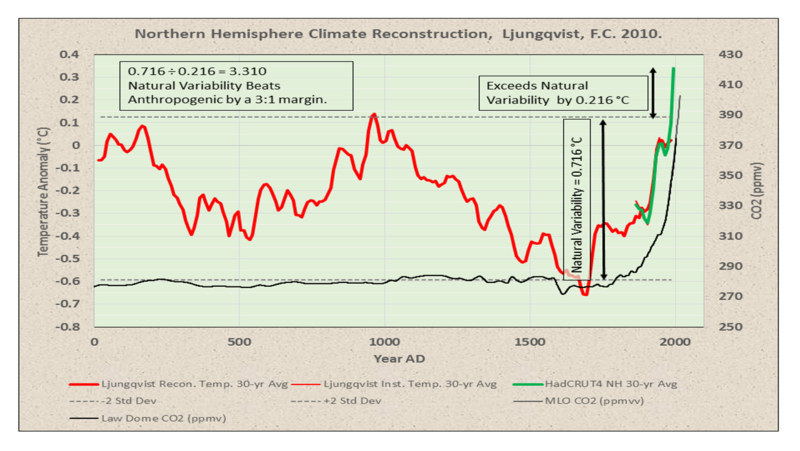 The point was that the instrumental data only exceed the pre-industrial variability by 0.21 C. Some of this could be related to AGW. However, it could also be entirely due to the resolution differences between the data sets. I want to back down my .054 degree increase from .216 degree C above peak of MWP to .035 degree C increase, to bump up the .216 to .251 instead of .27 degree C (which I typo-ed as .26) above the peak of the MWP. This is to factor for my 4-year shift causing a nearly .003 degree C warming by replacing 4 years with 4 others that I figure were on average a little over .14 degree C warmer due to multidecadal oscillations. Oops, where I just posted .003 I forgot to change that to .019 while I was rechecking my calculations. .14 degree C warming due to multicadal oscillations, applied to 4 years out of 30, accounts for .019 degree C of warming due to my proposed 4-year shift. No one actually ever sets out to have a blow-out. IXTOC was government and Deepwater Horizon was private – either way standards need to be followed. That isn’t always the case. Disasters are usually a group effort. A chain of events and decisions by individuals can add up to undesired consequences. IIRC, no one can say for certain where all the spilled oil went. It appears nature spills far more into the ocean than man ever could. “We can’t just drill our way to lower gas prices”. Yes, we have! There, fixed it for you. What lousy timing : Mexico discovers oil just as the world’s automakers (all of them) are on the threshold of riding lower battery prices into a new era of gas-free automobiles. And the key point is that “Mexico” didn’t discover this oil. 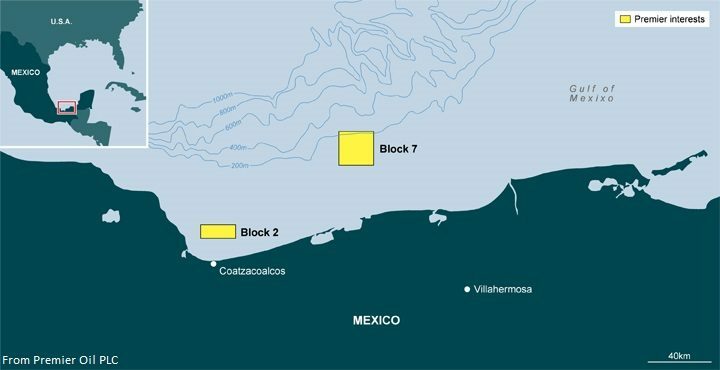 The first exploration well drilled in Mexico in 70 years, not drilled by Pemex, resulted in a 1.4 to 2 billion bbl discovery. Talos, the operator, is a privately held US company. Sierra is a privately held Mexican company. Premier is a publicly traded UK company. Delusional thinking at it’s best. Even the IEA has acknowledged that Obama’s policy has not achieved a sustainable energy policy to achieve the CO 2 reduction targets laid forth. Also I note that Obama spent millions for alternative liquid biofuels and now it seems they are admitting it was a giant failure since France and others are abandoning renewable liquid fuels and mandating electric cars. Do we get a refund on the failed biofuel investments? Strange we were subsidizing the development of a fuel for an internal combustion engine and now we ban the engine outright? What a gross failure and waste of resources! These are the fools who want to decide and pick which technology will win the battle for the future, such fools they are to ignore good engineering and science and listen to uninformed enviros. These are also the fools who want 100% control of all our healthcare. I’m glad Obama’s quote has re-surfaced. His Harvardian economic Rule of Supply and Supply has been drowned in the real world mantra of Drill Baby, Drill! Mike, Unfortunately history proves your point on the cycle. Boom in exploration, nationalize, failure, bring in outside expert, success, nationalize, failure, etc. This is how socialism repeats failure again and again, note Venezuela who is at the bottom of the cycle just now. 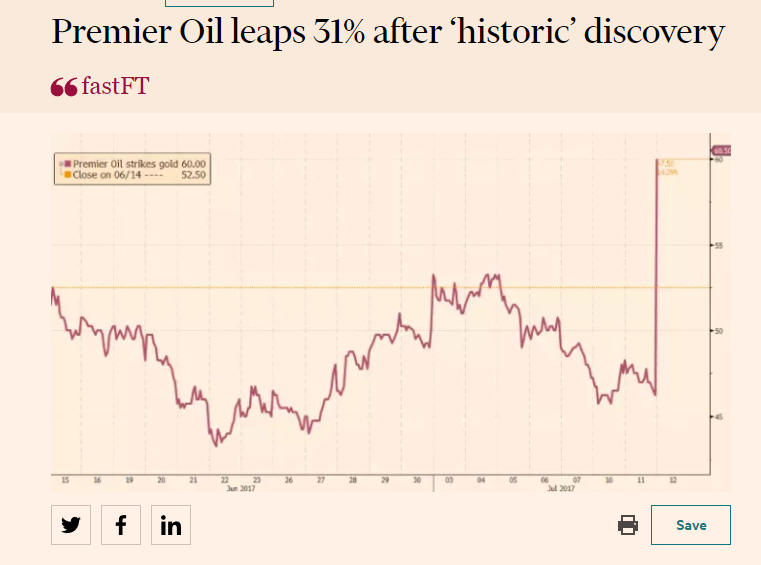 Well this certainly isn’t good news for those of us with oil company stocks. Talk about a HOCKEY STICK!!! The other two companies, Talos and Sierra, are privately held. As a fungible commodity, it will help keep oil prices low – in the +/- $50 bbl range, for quite some time. We are blessed to be living during this time. There was a time not so long ago we were staring down the barrel of $200. 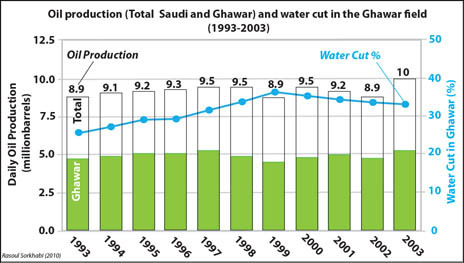 To put this new discovery into perspective (at ~2Bbbl TRR) the world needs about three of those discoveries per year just to offset the decline of Ghawar, which was reworked for the southern section with secondary water flood in 2010 and which Saudi Aramco predicts will be fully depleted around 2035 even with tapering to maximize eventual recovery. In 2012 when I finished writing Gaia’s Limits after 3 years of research, Ghawar by itself provided 6% of the world’s total crude production. When Ghawar starts its decline, the slack will be taken up by some combination of the other 70,000 active oil fields in the world and new discoveries like Zama (which will be fairly common on the Mexico side of the Gulf over the next decade or so). How much oil in Ghawar? No one exactly knows how much oil lies beneath Ghawar. Some estimates (World Energy Outlook, 2005 and 2008) put the oil in place as high as 250-300 billions! However, simple calculations using the reservoir volume, porosity, and water saturation for all the five areas of Ghawar (Table 2) would give the maximum amount of oil in place at about 190 Bbo. How much of this oil (if true) is recoverable is another story. Total recoverable oil reserves from Ghawar have been reported variously as 75 Bbo (Halbouty et al., 1970, AAPG Memoir 14), 68-46 Bbo (Oil & Gas Journal issues 1973-77), 80.3 Bbo (Beydoun, The Middle East, 1988), 66 Bbo (Mann, 2003, AAPG Memoir 78), and 140 Bbo (World Energy Outlook, 2008). The latter source places the natural gas reserves of Ghawar at 186 Tcf, thus giving combined reserves of 97 Bboe. Compared to the supergiant size of Ghawar, our public knowledge of this field remains insignificant. Oil fields, whether small or large and wherever they happen to be located, eventually come to an end, but giant fields have enormous life spans. The thing about improving technology for retrieval is that the better we do with it, the faster and quicker the decline will be when it comes. No. Improving technology prolongs the decline. Eugene Island 330 field was discovered shortly after the recognition of seismic direct hydrocarbon indicators (bright spots). Without the advent of improved seismic imaging (3d and 4d seismic), the field might very well have been abandoned after only producing 250 million barrels. Prolonging the decline is a good thing. Talos Energy one of the partners in the Zama-1 has put out gross estimate of 1.4 – 2.0 billion bbl. So it is possibly twice as big a hit as the title suggests. And drilling somwhere close by (Amoca 1,2 & 3 ) in the same basin the italians (ENI) recently put out news of a find estimated at 1.3 billion bbl. so alredy discoved finds are perhaps above 3 billion bbl. All in shallow waters and hq stuff light oil. Oh yeah… This well was just the tip of the iceberg. “David Middleton” and “ristvan” (ABOVE) touch on the potentials for Green River oil shale extraction. It would put peak oil out to the 23rd century. “Producers would microwave oil shale formations with a beam as powerful as 500 household microwave ovens, cooking the kerogen and releasing the oil. It also would turn the water found naturally in the deposits to steam, which would help push the oil to the wellbore. ‘Once you remove the oil and water,’ Kearl continues, ‘the rock basically becomes transparent’ to the microwave beam, which can then penetrate outward farther and farther, up to about 80 feet from the wellbore. It doesn’t sound like much, but a single microwave-stimulated well, which would be drilled in formations on average nearly 1,000 feet thick, could pump about 800,000 barrels. Qmast plans to have its first systems deployed in the field in 2017 and start producing by the end of that year. “Peter Kearl is co-founder and CTO of Qmast which is a Colorado-based company pioneering the use of the microwave technology to recover oil. Oil giants BP and ConocoPhillips are pouring resources into developing similar extraction techniques, which can be far less water- and energy-intensive than fracking. There is more than 4.285 trillion barrels of oil barrels of oil in the Green River Formation (2011 U.S. Geological Survey of resource in-place). Using oil shale cutoffs of potentially viable (15 gallons per ton) and high grade (25 gallons per ton), it is estimated that between 353 billion and 1.146 trillion barrels of” oil. ..I love the ability of the U.S. extracting all the oil and gas it can until we find an alternative, but, what is left in the area it was extracted from, giant holes in the crust ? Does this cause instability in the surface above ? Or is it filled with something, or does it even matter ? It doesn’t leave “giant holes” in the ground. It can sometimes lead to some subsidence of the surface above the reservoir. In the case of water-drive reservoirs, the pore space is filled with a mixture of brine and hydrocarbons. In pressure-depletion reservoirs, the pore space is filled with a mixture of brine and hydrocarbons at a much lower pressure. The very notion of microwaving to extract oil shale is mouthwatering, because it is a water-free process, and doesn’t leave behind waste—one of the main points of contention between the oil industry and environmentalists. It can also save on new-well investment by maximizing the yield from existing wells. If this works, it would make the Green River comparable to the Bakken or Eagle Ford in terms of resource economics and it clearly terrifies the greenhadists… A win-win. 1. What has been discovered to date? Over 1,100 foot [335 meter] gross contiguous pay section was encountered in the main Upper Miocene objectives, with net pay of approximately 660 feet [200 meters]. The rock properties appear to be of excellent quality. P90 and P10 gross OOIP calculations currently range between 1.4 and 2.0 Billion BOE, including a portion that possibly extends off the block. This estimate is on the high end of our pre-drill estimates. 3. What type of hydrocarbons were discovered? Zama contains light oil, with API gravities ranging from 28 to 30 with some associated gas. 4. Have resources already been discovered on Block 7? No; in contrast to the developments at Amoca and Hokchi, which were awarded in Round 1.2, Block 7 was a true exploration effort, as there were no wells ever drilled on or near the block. The closest well to the Zama prospect is a dry hole, approximately 20 km away. 1. How big is Block 7? Block 7 is over 122,000 acres. The consortium also owns Block 2 from Round 1.1, which is over 48,000 acres. The consortium has reprocessed the 3-D seismic on both blocks as it calibrates the Zama discovery to other opportunities. 2. Are there other opportunities on Block 7? The discovery at Zama makes a number of other prospects on the block, both shallow and deep, look attractive. The consortium will be working with the government to modify the existing exploration plan and gain the necessary permits to drill those opportunities in the future. You are commended for a great, informative post. Also your patience to stay with it and offer even more useful information again and again is great follow-up.